Is a special someone in your life turning 40? Make their birthday extra sweet by sprinkling it with a candy assortment of hard-to-find candies for loved ones who grew up in the 80s. These specially curated care packages feature a candy mix of rare and unusual sweets they haven't seen in decades, including Atomic Fireballs, Bonomo Turkish Taffy, Dots, Chuckles, Mike and Ike, Red Hots, Jawbusters, Pop Rocks, Razzles, Mary Janes, Fun Dip, Pixy Stix, Candy Necklace, Sugar Daddy Jr., Wax Lips, Candy Buttons on Paper, Candy Cigarettes, Bubble Gum Cigarettes, Licorice Pipe, Saf-T-Pop, Bubble Gum Cigar, Chick-O-Stick, Charleston Chew, Coconut Long Boy, Gobstoppers, Sixlets, Zero, Sugar Babies, Zotz, Lemonheads, Strawberry Drops, BB Bat, Butterscotch Buttons, Cinnamon Discs, Licorice Balls, Necco Wafers, Now and Later, Kits, Root Beer Barrels, Smarties, and Classic Caramel. Please note, on occasion, we might have to substitute an out-of-stock item with candy of the same value. This eclectic collection of nostalgic candy is more than a present. It's a special 40th birthday gift that they will remember long after the sweets are gone. 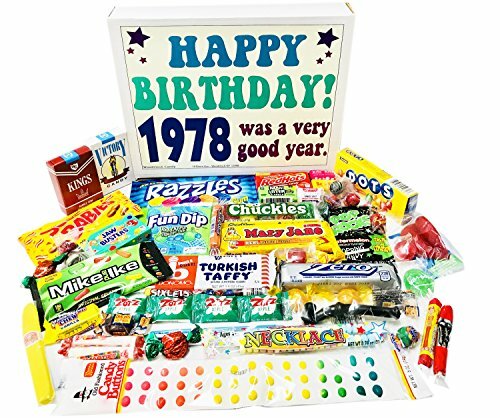 In celebration of the year they were born, the candy box reads "1978 was a great year. Happy Birthday!" Life is short...Eat candy-and not just any candy but everybody's favorite treats for those who grew up in the 80s. Everybody loves candy because it makes life a little sweeter, which is why this 40th birthday gift is perfect for everybody in your life, including family members, co-workers, and the hard-to-shop-for friend that has everything. A real "taste of the past," nobody will be able to resist trying some of the snacks they used to love as kids.